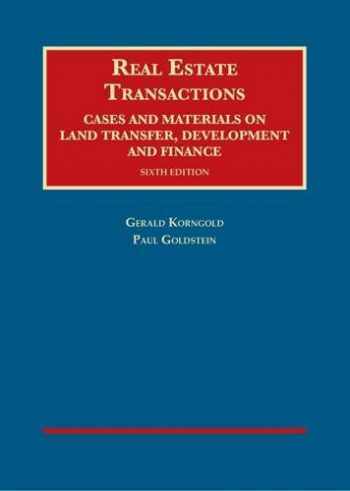 Acknowledged author Gerald Korngold wrote Real Estate Transactions, Cases and Materials on Land Transfer, Development and Finance (University Casebook Series) comprising 1045 pages back in 2014. Textbook and etextbook are published under ISBN 1609302206 and 9781609302207. Since then Real Estate Transactions, Cases and Materials on Land Transfer, Development and Finance (University Casebook Series) textbook received total rating of 3.5 stars and was available to sell back to BooksRun online for the top buyback price of $81.69 or rent at the marketplace. This casebook covers all the major aspects of real estate transactions, running the gamut from residential transactions to sophisticated commercial development. Highlights of the new edition include revamped mortgage materials to reflect the subprime and mortgage finance crisis, ensuing foreclosure issues, and new regulation; new cases and materials on the core elements of the real estate transaction, including contract conditions, remedies, and the deed; new cases and materials in other sections of the book, including, among others, recording, condominiums, commercial development, and bankruptcy; a new subsection on green buildings; and a revised structure for the book, including consolidation and streamlining of all tax materials. Five brief drafting exercises allow students to apply their learning and to see how to reach better results for clients.